Born Berkeley, California, May 18, 1924. Irish-German descent. Parents born in U. S. Throws right. Bats left. Hair brown. Eyes blue. Height 6' 2". Weight 210. New to the Oaks lineup this year, walloping Will piled up a .340 batting mark while outfielding for Idaho Falls last season. Between basehits, he pitched in 13 games, too, winning 5 and dropping 6 in 13 starts. 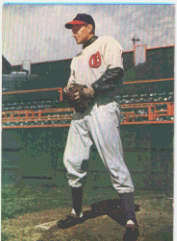 Hafey attended high school in Oakland, Calif., where he lettered in baseball, and his team won the championship two years. Father is plasterer. Wilbert is a cousin of Chick Hafey, brother of Bud Hafey and Tom Hafey, all professional baseball players. A real baseball family -- even more numerous than the Raimondis. In his first professional game, Will won two neckties for hitting two doubles. That's nice hitting for haberdashery. Greatest player, Ty Cobb. Owes most in baseball to his brothers who gave him valuable pointers. Baseball ambition, to be a 10-year man in the majors. Otherwise to be an aircraft maintenance man. Winter occupation, stock clerk. Hobby, duck hunting. Personal preferences -- movies, mystery; clothes, conservative; food, lots of steaks; reading, detective; women, streamlined blondes. Greatest baseball thrill, winning first professional game 3-2 in twelve innings. Toughest thing in baseball is to make a double play first to short to pitcher covering first on the return. Superstition, crossed bats.